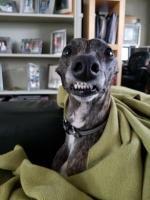 Best tips to make the most comfortable whippet beds at home with cheap or recycled materials. My dogs taught me how to make comfortable and cheap dog beds out of recycled materials. Whippets have little body fat and short coats and this makes them incorrigible comfort seekers but at the same time, when left alone they can indulge in reckless cushion hunting. The bed filling seems to unleash their strongest killing instincts and gutting out the insides of a new, fancy dog bed seems to be one of the most cherished activities of my little hounds. More than once I came home to a garden or a kitchen decorated in typical whippet style, with the bed filling scattered all over the place. After these experiences I learn that designer pet beds are not always the best investment. 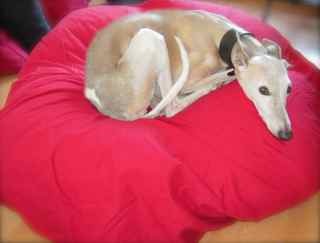 These are the best solutions I found to give my whippets comfy and cheap dog beds. The easiest solution to make a dog bed for the yard is newspapers. Buying your newspaper daily, not only you will keep updated with the latest news and trends, but will also provide a wonderful material for your dog’s bedding. Newspaper make cheap, insulating, clean, disposable and totally chew resistant dog beds. They can be used to pad a crate or dog house. First place a generous layer of newspapers at the bottom and then shred a few on top to make it cozy and soft. My oldest whippet likes to burrow in them for warmth and comfort. The downside of this arrangement is that the pieces of newspaper tend to fly and get scattered around the garden, giving it a messy look. Open the sheet on a wide surface. 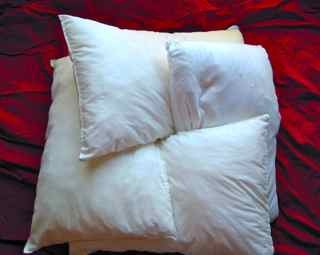 Place on it the pillows like in the picture. 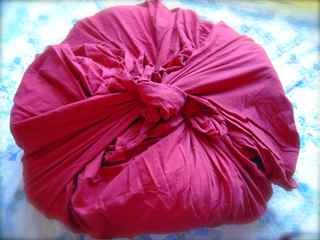 With two opposite corners of the sheet make a knot and then tie the other two opposite corners. Turn the bed upside down and call your dog to enjoy the coziest bed he’s ever had. This bed is easy to wash, heavenly soft but, of course, not for inveterate chewers. To make your own dog bed at home is cheap and easy and, as a added bonus, you can completely customise it. Making your own dog bed, will also enable you to choose the shape that betters suits your living arrangement, for example a corner dog bed could be a great space saver in a small house. With the fabric of your choice you can match your home decoration or choose extra tough fibers to sew wear and chew resistant dog bed covers. A heavy cotton twill or canvas is breathable, strong and easy to wash. Stain treated cotton will make it easier to keep clean your dog’s bed. Fleece is cozy and warm in winter but hairs tend to stick to it. 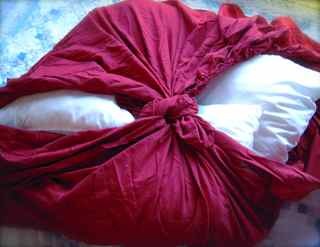 It is a good idea to make different bed covers that you can change according to the season. You can also choose the best filling for your personalised dog bed. There are different options to suit any pet’s need. Polyester fill is silent, soft and easy so wash, an excellent choice for most dogs. A little pine or cedar shavings added to the filling helps control odor and acts as insect repellent but is not advisable to use it for hunting dogs as it can interfere with their scenting ability. Memory foam is a dense polyurethane foam. It is firmer when cool and softer when in contact with a warm body so it has the capacity to mold around a body in few minutes. It is very comfortable, supportive and relives pressure points, is the ideal filling for your senior or arthritic pet. Polystyrene beads are soft and retain warmth but can become a nightmare if your dog decides to work his teeth in his nest and gets the beads loose. Calculating the size of the bed can be tricky. My whippets can spread out to a considerable size or roll up into a tiny ball. This is a simple rule of thumb to calculate the approximate size of the bed. Measure your dog (it’s easier when he is sleeping) from the top of his skull to the beginning of the tail. This measure will give you a good idea of the length of a rectangular bed or the diameter of a round one. Keep in mind that your dog should be able to stretch out completely on the bed without falling out. When cutting the fabric allow at least one extra inch for sewing. The latest trend in whippet beds are the cave beds. They provide comfort and warmth even to the most discerning hounds. No more slipping blankets and shivering whippets! A dog crate can make a durable and cozy dog bed. Click on the title to find out what's the right crate for your whippet and how to crate train your dog.